With so many diet tips floating around the Internet, you may feel overwhelmed when trying to choose an appropriate weight loss plan. Debunking popular diet myths will help you get the results you're seeking and can make it easier for you to stick with healthy plans long term. Nighttime eating can lead to weight gain if you're overeating, but eating late at night isn't the cause of weight gain. West Virginia University reports it's a myth to think eating late in the evening makes you fat, because calories are calories regardless of what time to eat them. Wake Forest Baptist Health debunks a similar myth that states eating after 7:00 pm makes you fat. However, it's important to avoid eating extra calories from junk food late at night. Instead, choose a protein shake, fruits, vegetables, whole-grain cereals, nonfat Greek yogurt, nuts, seeds, or protein-enriched almond milk if you're feeling hungry before bed. Total calories are what count when it comes to dieting and weight loss, so you don't have to eliminate junk food entirely. As long as you reduce your overall calorie intake, you'll see weight loss results. However, because unhealthy junk foods are generally higher in calories and fill you up less than healthier alternatives, it's best to limit foods like chips, fried foods, baked goods, sweets, and sugary drinks as much as possible. Exercising does not equal weight loss. In fact, reducing calories is more effective than exercise for weight loss, according to Mayo Clinic. That's because some people eat more in response to exercise, either because they think they've earned it or because they feel hungrier. Starting an exercise program means you may gain muscle mass, which weighs more than fat. However, regular exercise does help you burn more calories and maintain weight loss. Therefore, as long as you're careful about what you eat, exercise is beneficial during weight loss. While it's true protein helps fill you up, boosts your body's energy expenditure, and is beneficial when combined with a lower-carb diet for weight loss, more protein isn't always better. Too much protein adds extra strain on your kidneys, may increase your risk for osteoporosis, and can cause unpleasant side effects like nausea, constipation, bloating, and abdominal cramps. A 2015 review published in The America Journal of Clinical Nutrition reports eating between 0.55 and 0.73 grams of protein per pound of body weight daily, or about 25 to 30 grams of protein at each meal, is beneficial for weight loss and healthy weight management. You don't have to cut out carbs to lose weight, and carbs do not cause weight gain, according to the University of Washington. Carbohydrates are your body's main source of energy and cutting them means you'll have a difficult time working out or even concentrating at work. Many healthy carb-containing foods, such as fruits, vegetables, whole grains, nuts, seeds, legumes, and low-fat dairy foods, are beneficial for shedding pounds. The Institute of Medicine recommends adults eat at least 130 grams of carbs daily. However, limiting carbs, especially from sweets, sugary drinks, white rice, white bread, and other refined grains, helps lower your overall calorie intake, which is effective for weight loss. While it's true fasting can help you cut calories, it's generally not recommended for effective, long-lasting weight loss. The National Institute of Diabetes and Digestive and Kidney Diseases (NIDDK) reports it's myth to think skipping meals is a good weight loss strategy, because doing so makes you hungrier and more at risk for overeating at your next meal. NIDDK also reports people who skip breakfast tend to weigh more than those who consistently eat healthy breakfasts. Instead of skipping meals or fasting, aim for small, frequents meals spread evenly throughout the day. It's true you're lowering your intake by about 150 calories every time you pick diet soda in place of regular soda. However, drinking beverages flavored with artificial sweeteners is actually associated with weight gain, according to a 2010 review published in the Yale Journal of Biology and Medicine. Authors of this review suggest because artificial sweeteners are sweet like sugar, they encourage sugar cravings and dependence. They also appear to increase appetite and overall calorie intake. Reducing fat in your diet can lead to weight loss, but low-fat diets aren't necessarily the smartest weight loss option. West Virginia University reports dietary fat boosts satiety, supports fat burning, and helps prevent dull, dry skin. Aim to get about 25 percent of your daily calories from fat, which equates to 33 grams daily when following a 1,200-calorie weight loss plan, and 42 grams when eating 1,500 calories per day. Choose healthy fats like plant-based oils, fish oil, nuts, seeds, nut butters, olives, and avocados. It's true that lifting weights can increase muscle mass, and muscle weighs more than fat. However, NIDDK reports resistance exercises like weightlifting, sit-ups, or pushups help you burn more calories. Lifting weights two to three days weekly will not bulk you up or cause weight gain. However, if want to keep muscle gains to a minimum, choose lighter weights and more repetitions (15 to 20 reps), use your own body weight for resistance, or try resistance bands instead of heavy weights. 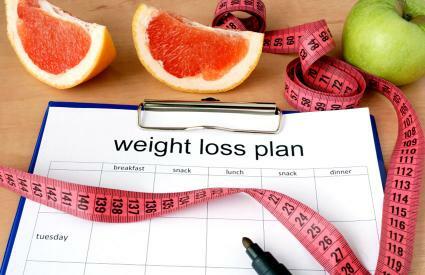 Some commercial weight loss diets like Weight Watchers and Jenny Craig are backed by research as being effective for shedding pounds. Some weight loss fad diets can be quite expensive and are just unique ways of presenting reduced-calorie, healthy eating plans. The good news is you don't have to spend lots of money to lose weight. Simply reduce your current intake by 500 to 1,000 calories daily, or eat 1,200 to 1,500 calories per day. There are plenty of free calorie tracking and meal planning tools available, such as the USDA's Food Tracker and MyPlate Daily Checklist 1,200 calorie and 1,600 calorie plans. Regardless of what you eat, calorie reduction is the key to effective weight loss. Busting common diet myths helps you choose the best weight loss strategy based on your individualized needs.